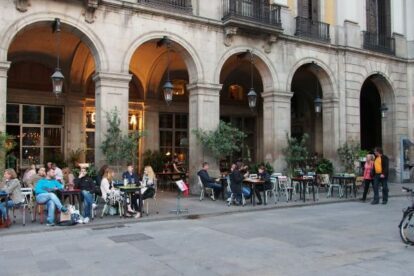 Ocaña is located in one of Barcelona’s most vibrant squares, Plaça real, which can sometimes become a little overwhelming for choice, due to the high amount of cafes and restaurants you may encounter. After having tried a few, Ocaña became one of my most frequented places. Ocaña is restaurant, cafe, cocktail bar and club, all at the same time, and all in a space of more than 1000m2 over several levels. Once you enter, it’s almost like going on a little trip back in time that takes you to the Belle Époque, with its furniture and gold columns, to the antique markets of old Europe, or to some of the best design studios. The decoration and architecture is a whole show in itself. You have an outside area where you can enjoy a good glass of wine or a cocktail (I have to recommend Aperol Spritz) accompanied by some tapas; an inside area which is the restaurant/cafe, and finally an area downstairs which is the club and Apotheke, a very peculiar cocktail bar with oriental-style carpets that evokes the luxurious interiors of Arabian places. A whole experience for the senses and an original journey without leaving Barcelona.